The LODGE is proud to present Behind The Screen, the Los Angeles debut solo exhibition for acclaimed Australian artist David McKay, opening on 16th May 2015. 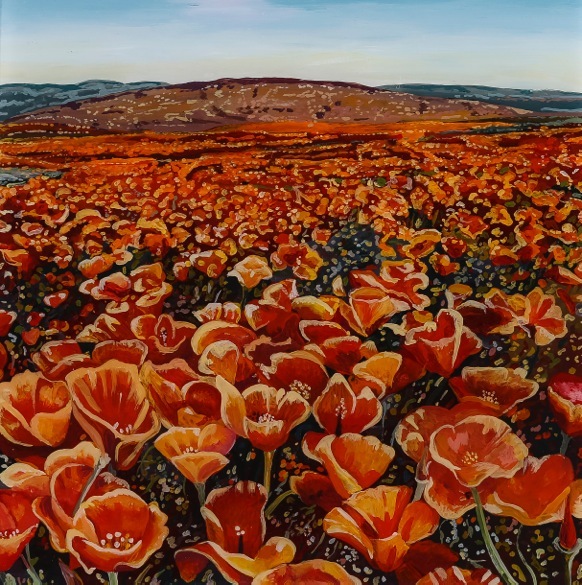 Inspired by the idea that so much of our lives is consumed through a screen, and what we see is behind a piece of glass, McKay’s works are collection of vivid, colorful painted landscapes. They are rendered on clear plexiglass in an application of loose impressionistic brushstrokes that amplify the contrast to the perfection of the digitally transmitted image behind the screen. The imagery pays homage to the landscapes of his adopted home in the northern hemisphere depicting autumnal orchards, rich blossom and vibrant Californian desert landscapes. The technical challenge of painting these works in reverse, where the last brush stroke is painted first, along with McKay’s characteristic sense of bold colour and imagery are reflected in the almost pointillistic, painterly stylisation. Currently he is working on a series of seasonal landscapes, painted in reverse on clear plexi-glass panels. Most recently was both the Production and Costume Designer on the feature film ‘Manny Lewis’, a romantic comedy starringAustralian stand up comic Carl Barron, to be released in early 2015.